Please note that some of the links included in this post help my website as I may earn a small commission at no extra cost to you. We love Yahtzee! It is always fun and is a simple game to play! My kids have to add up their own score each time they roll which has helped with adding and times tables. It’s also a great game in that it doesn’t take all night to play. A game can be played in as little as 20 minutes. Golf is a great game for working memory as well as working on addition! There are many variations to this game. You can watch a video of the general rules of 4-card golf here. We play a different variation of this in our house where we have both Kings and 10’s worth 0 points, Jacks and Queens count as 10 points each and all other cards are face value. As with the golf course game, the person with the lowest score at the end of the game wins. In our house, we end the game when the first person gets to 100 points. The other variation to the video that we do is that, although we do look at only the bottom two cards, we are only allowed to do this one time prior to starting a round. We then have to remember those cards for the remainder of the round. We also place one of our cards face up each time it is our turn. This can be from the top card in the discard pile, the card we picked or the one that was originally one of the 4 cards dealt to us. 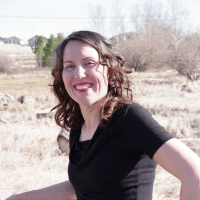 Once a card is committed to and face up, we cannot change our minds… even if the card we may have exchanged it for would have been a lower scoring card. The round ends after each of us has had 4 turns and, therefore, 4 cards face-up. At that point, we add up our totals for the round and deal again. There is no knocking to end a round in the version we play. Thirty-One is a fun game that can be played with only a couple of players or a lot. You can watch this video to go over the rules for Thirty One. 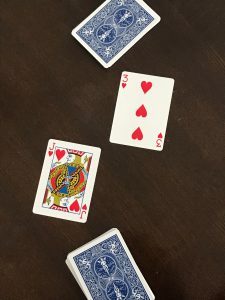 As is typical of card games, there are variations to this game that can be played, but the video covers the general rules and is a great place to start. The hand above shows a total of 31. War is a great game for two people to play that requires players to know (or learn) which numbers and cards are higher than the others. 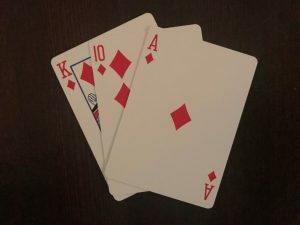 Aces are the cards of highest value in this game, Kings second highest and 2’s are lowest. Check out this video to watch how the game is played. In the photo above, the player with the Jack would keep both the Jack and the 3 because the Jack is higher than the 3. 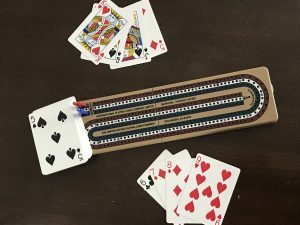 Cribbage is another game that is fun, requires some math to be done, and can be played with 2-4 players. 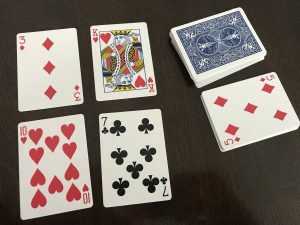 This video shows how to play with 3 players and goes over how to count points throughout the game when playing Cribbage. If you play with 2 players, each player is dealt 6 cards and puts 2 cards in the crib. If playing with 4 players, each player is dealt 5 cards and places 1 card in the crib. When playing with 4 players, you have two teams with 2 players each. Partners sit across from each other, but use the same pegs as their partner for scoring. Top hand would score 18 points… 2 points for each of the ways the cards total 15 for a total of 12 points, 2 points for the pair of 5’s, 3 points for the J,Q,K run and an additional point for the nob (the Jack being the same suit as the card that was cut, which is the 5 of spades). Bottom hand would score 9 points… 2 points for the 9+6 equaling 15, 2 points for the 8+7 equaling 15, and and additional 5 points for the run of 5,6,7,8 and 9. 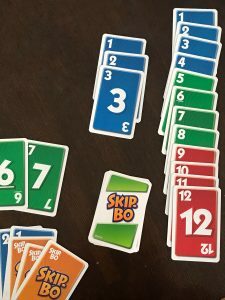 Skip-Bo is a sequencing card game, requiring players to sequence numbers repeatedly from 1 to 12. 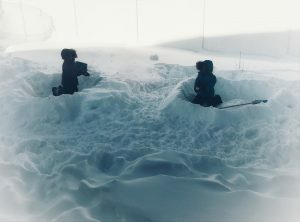 The game can be played with anywhere from 2 to 6 players. To get a general idea of how this is played, you can watch this video. 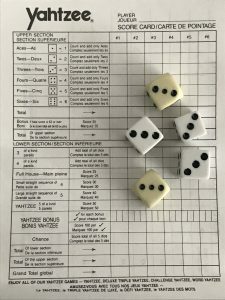 If you are looking for even more ideas for games to play, you can check out this post I wrote awhile ago that goes over some other game ideas that have math involved.